Let the season of magic begin! Be part of the magical festive revelry throughout the month of December. Discover ideas for fun family jaunts on Christmas Eve, Christmas Day, Boxing Day, New Year’s Eve and New Year’s Day! We’re sure to put you in the joyful spirit with something marvellous for everyone. Join us as we light our Christmas tree for the first time on 11th December, from 6:30 PM at Le Méridien Hub. Kids 3 to 10 years can enjoy complimentary gingerbread making sessions at Yalumba from 4pm till 6pm, while you enjoy delicious festive nibbles and refreshments and a live performance by our choir singing your all-time favourite Christmas carols! Happening daily from 20th till 24th December, 7:15 PM till 8:15 PM Make the most of your merrymaking with this essential guide to all that’s good and jolly during the holidays at Le Méridien Dubai Hotel and Conference Centre! *Prior booking is required for the gingerbread making session. To register, call 04 702 2455 or email [email protected]. Don't miss our early bird offers up to 15% discount, more details below. 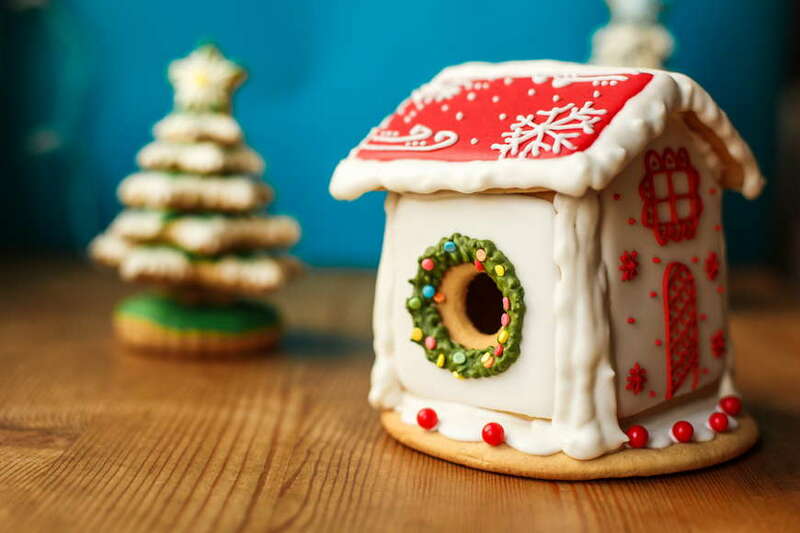 Younglings are welcome to join us build and decorate gingerbread houses with the help of our friendly elves! We have programmed exciting activities, yummy treats and entertainment, with a daily visit from Santa starting from 12th December till 24th December, 4 PM – 8 PM. AED 25 for kids up to 12 years, prior registration is required. To register, call 04 702 2455 or email [email protected]idien.com. Treat your friends and family with a selection of delicious festive treats, traditional roast turkey and some meaty options to take home from 11th December till 31st December 2018. Enjoy all things magical, from an array of traditional festive favourites and free-flowing seasonal beverages to kids’ interactive activities, live entertainment and much more! Indulge in a hearty holiday dinner with live entertainment. Bid farewell to the old year and move on to the new with a big party full of fun games, live music, biggest dance favourites and lively countdown. We will be throwing the best holiday party combined with great food, free-flowing holiday drinks, kids’ activities, live music performances, loads of entertainment and much more! All-inclusive BBQ themed dinner with live cooking stations and live entertainment. Incredible all-inclusive festive feast with live entertainment and kids’ corner. Welcome this New Year in style at Warehouse with our Bollywood themed dance party. Great food, creative beverages, live band and an amazing line up of DJs will ensure a memorable New Year’s Eve experience. A laid-back festive brunch with live entertainment by an Irish Band. Unwind with a boxing day lunch and let the excitement continue after Christmas day. Delight in a special à la carte festive menu whilst being entertained by live music performance. Celebrate this season at the fabulous Le Meridien Village Terrace, boogie-on-down as our resident band X Groove get the party started. Take pleasure in a lavish buffet spread, live cooking stations and endless beverages, whilst enjoying the live performance of our resident band X Groove. A Christmas feast with the whole family! An all-inclusive garden brunch with a kids’ area full of activities and a live entertainment by resident band X Groove. Dine under the stars on Christmas Day! Featuring traditional favourites, live cooking stations, free-flowing festive drinks and live music by resident band X Groove keeping you entertained throughout the night. You will be whisked away by the splendour of the night whilst enjoying a delicious buffet spread with free-flowing holiday drinks. Our resident band X Groove will keep you entertained all night. EA R LY B I R D O F F E R ! Enjoy 15% discount on all Le Meridien Village Terrace’s festive packages if you book before 1st December. As you indulge in our festive themed à la carte menu with a Thai twist! Don’t miss the traditional Thai dancers’ performance to add to the festive mood. Where the team serves up a special à la carte menu filled with authentic Italian taste. Bringing the flavourful Mexican cuisine and lively entertainment this holiday season. All you need to do is bring your amigos and celebrate with us this festive season! Party and dance the night away whilst listening to the tunes by resident band Skills and Verse Two! Kick start 2019 the right way with our epic Coyote Ugly party! Prepared with a little festive spin that will have you wishing this season lasted all year round! This legendary seafood restaurant boasts 18 sea-water tanks featuring delicious oceanic treasures from around the world, displayed market-style and cooked based on your liking, perfect for a special festive meal with the whole family. There’s nothing quite as heartwarming as dining on a prime cut of mouthwatering steak this festive season! Get your fill of T-bone, sirloin or tenderloin amongst other cuts charred with fire by our grill masters. Kiku IS An ideal destination to experience authentic Japanese dining this festive Season! Explore some of Japan’s favourite food during the festive season. Mahec combines traditional recipes dating back centuries with modern palettes and styles. Delight in a festive-inspired 5-course set menu featuring all the seasonal favourites. Delight in a festive-inspired 5-course menu featuring all the seasonal favourites. The wicked Bollywood beats of DJ Stephen Crown will keep you entertained to welcome 2019 paired with our signature Tandoori Kebabs, Curries and more! Nothing beats a traditional Lebanese experience where the mouth-watering food meets the best entertainment. The live music and artist performances will keep you merry on Christmas day! international artists to ring in your New Year. Ring in the season of celebrations with Le Méridien Dubai Hotel and Conference Centre, illuminate your successes in one of our 24 event venues. Whether it is a corporate gathering, social evening or year-end party, our event specialists will put together a show of limitless imagination. New Year’s Eve Party by Spotlight Recreational Services featuring Wael Kfoury and Nassif Zaytoun live in concert!